BBC America has released a new character teaser clip for the upcoming and highly-anticipated second season of their hit drama series Killing Eve. Featuring our resident tech genius Kenny (Sean Delaney), you check out the video below and find out what happened to Elena in the player below. Based on the novellas by Luke Jennings, BBCA’s Killing Eve centers on two women; Eve is a bored, whip-smart, pay-grade security services operative whose desk-bound job doesn’t fulfill her fantasies of being a spy. Villanelle is an elegant, talented killer who clings to the luxuries her violent job affords her. Killing Eve topples the typical spy-action thriller as these two fiercely intelligent women, equally obsessed with each other, go head to head in an epic game of cat and mouse. The first season of Killing Eve capped with an unbroken record of weekly ratings growth in the key adults 25-54 and 18-49 demos, which has not been accomplished by another series on television in over a decade. 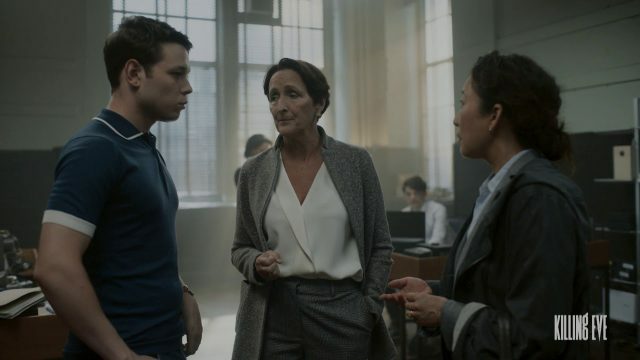 Oh received an Emmy nomination in the Outstanding Lead Actress in a Drama Series category for her role as Eve Polastri, with Phoebe Waller-Bridge nominated for Outstanding Writing for a Drame Series. The Television Critics Association named Killing Eve the Best New Show when the first season aired. Damon Thomas has returned to direct the second season and will executive produce with Lisa Brühlmann and Francesca Gregorini also set to direct. Killing Eve is produced by Sid Gentle Films Ltd and executive produced by Sally Woodward Gentle, Lee Morris, Phoebe Waller-Bridge, Gina Mingacci, and Emerald Fennell with Sandra Oh co-executive producing. Elinor Day serves as series producer. The second season is currently shooting in Europe. Season 2 premieres on Sunday, April 7 at BBC America.